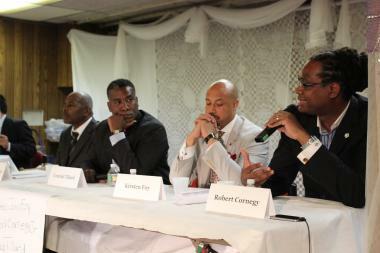 From left, Reginald Swiney, Conrad Tillard, Kirsten John Foy and Robert Cornegy debate education policy in Bed-Stuy on Aug. 13. BEDFORD-STUYVESANT — These candidates get an "A" for "argumentative." An education debate in the race to replace outgoing City Councilman Albert Vann turned heated on Monday night, as candidates began criticizing each others' qualifications for the job. Throughout the first hour of the more-than two-hour debate, the four candidates on stage at Mt. Lebanon Baptist Church — business owner Reginald Swiney, Rev. Conrad Tillard of Nazarene Congregational Church, Kirsten John Foy of the National Action Network and District Leader Robert E. Cornegy, Jr. — remained polite. But the otherwise civil discourse turned contentious when candidates became upset at Tillard for saying they weren't doing enough to help struggling Boys and Girls High School. "I have to say, of my opponents here, who I have great respect for in other areas of the community, I have not seen one of them in Boys and Girls High School working on this issue of education," said TIllard. "When hundreds of parents came out to establish this stakeholders committee, I didn't see it." The comments by Tillard, who is on the community advisory board of Boys and Girls High School, were the first of the night to illicit reaction from the crowd, with one woman anticipating the ensuing exchanges by yelling, "here we go." The statements raised the ire of Cornegy, who said he had experience at the school. "That, by far, is the most disrespectful thing I've heard tonight," Cornegy said. "On nights that I spent mentoring in Boys and Girls High School with black male organizations, I didn't see you." The debate, sponsored by the Brooklyn Movement Center and moderated by Bed-Stuy Patch editor C. Zawadi Morris, worked in two parts, with the moderator asking prepared questions in the first half of the debate and the crowd submitting questions for the second half. Many of the questions provided the candidates a clear opportunity to make their views known to the public. On education funding, Tillard said he would work with like-minded politicians to help make sure resources are used properly. On how to better involve parents and the community in decision-making processes, Cornegy said he would enact participatory budgeting in the district so the community has more of a say of where their money goes. And on pushing for more out-of-school programs, Foy said the city should use underutilized schools to house private programs after school and on the weekends. Another candidate in the race, Rev. Robert Waterman, was unable to attend because of an obligation at his church. But as the debate dragged on, the candidates couldn't help taking a few more shots at their opponents. The biggest reaction of the night came when Swiney accused his opponents of not doing enough to save Interfaith Medical Center, which is set to close this year. Cornegy, visibly upset, said that on Sunday he protested at an all-night vigil to save the hospital, and is on the hospital's community advisory board. Foy, who with the National Action Network has held weekly meeting to address the problems of Interfaith and was arrested at a rally to save the hospital, was similarly upset. "That was a ridiculous statement," he said to Swiney. "I went to jail over Interfaith, and you were not in my cell with me." For his part, Tillard, whose original comments sparked the change in tone, said he wasn't trying to start trouble. "It's not a matter of being disrespectful," Tillard said. "It's a matter of stating the facts."